Below are the answers to some of your most frequently asked questions. 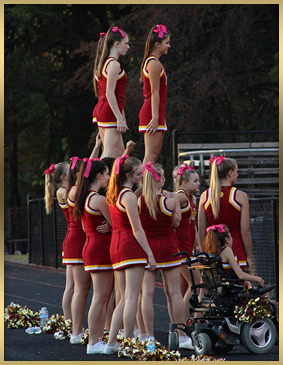 For more detailed information, please read the Lassiter Student Handbook (found on the Home page of this website) or call our front office. What grading system does Lassiter HS use? What is the procedure to check my child out of school before the end of the school day? Are students allowed to leave campus for lunch? My son/daughter would like to drive to school. Does he/she need a parking permit? May I set up an appointment to see my child’s school counselor? When do we register for next year’s classes? How do I go about making a schedule change? How do I obtain a Certificate of Attendance so that I can get a driver's permit and license? How can I obtain a work permit? How do I obtain or send a transcript? Our school day begins at 8:20 a.m. (warning bell at 8:15), and the last class ends at 3:30 p.m.
A teacher may give a student an “incomplete” when he/she has not been able to complete course requirements due to extended, excused illness or other hardship. The student may have up to 14 calendar days after the end of the term to satisfy the course requirements. If the student fails to make up the work within 14 days, the incomplete work will be counted as a zero, and the teacher will assign a grade for the course. It is the responsibility of the parent(s)/guardian(s) to notify the school in writing of the reason(s) for a student’s absence(s). This written statement from his/her parents/guardians or medical doctor must include the date(s) and reason(s) for absence(s), parent phone numbers (work and/or home), and the parent/guardian signature. This statement should be presented to the teacher of the student’s first class on the first day back at school. (If a teacher questions the validity of the communication, the school will attempt to establish authenticity.) The teacher will keep the statement and give the student an admission slip. If the student does not present a statement within two days, or if the absence is unexcused, we will mark the admission slip “unexcused.” The student is responsible for keeping up with the original admit slip and presenting it to each teacher whose class he/she missed. Students needing a second copy of an admit slip may be assigned a detention. Students are not entitled to any class cuts. Please read the Student Handbook (in the Quick Links on the Home page for more detailed information regarding our attendance policy. If a student is going to be out for up to 3 days or more due to illness or other related issues, a parent may call the school counseling office to request their work. School Counseling tries to give teachers a 24-hour notice for requested work. Teachers will drop off the work in the “homework” bin located in the front area of the school counseling office, and parents may pick it up in School Counseling during normal school counseling hours. Pupil personnel will verify the note and give the student a pass to return to the attendance office to sign out at the time of the early dismissal. Anyone who checks out a student must bring a picture ID. Students may not leave campus for lunch. Our school (as all Cobb County schools) has closed campus to ensure the safety of our students. Student parking on campus is a privilege, not a “right.” It is a reasonable expectation that students who receive the privilege to drive to school should demonstrate high levels of responsibility, self discipline, and maturity before, during, and after the school day. Juniors and seniors must meet the specific criteria to be eligible to apply for student parking second semester and each semester thereafter. Please see our Student Handbook (in the Quick Links on the Home page) for more detailed information. Absolutely. We want to help in any way we can. The receptionist at the front desk makes appointments for all the guidance counselors. Students may stop by, or a parent may phone and make an appointment to see the counselor. The assistant principal for curriculum determines the registration process and times. Registration for the next academic year occurs early second semester. This process takes place during the school day. Current academic teachers recommend students' core classes; students choose electives during lunch periods in the media center. Students send letters and schedules home for parents to see. Please be sure that you request any changes during the registration process; we make the master schedule for the next academic year from these requests. We will not honor a schedule change request made after the registration process is complete. Necessary schedule changes: During the first two weeks of the semester, counselors will make only valid schedule changes as determined by counselors, department heads, and administrators. Class waivers: If a student wishes to take a class not recommended by a teacher, he/she may complete a Course Change Waiver Form and turn it in to Guidance. The counselor will submit the waiver to the appropriate department head(s), and it may be granted if documentation substantiates the request and if there is room in the class. All waivers must be filed during the registration process. Teacher changes: We will honor requests for change of teacher only if the student has failed a course previously with the teacher and if space exists in another teacher's class. We will not consider any other request for teacher changes. Lunch changes: We will honor requests for a specific lunch time with a medical doctor's directive accompanied by a parent request. Students may obtain a certificate of attendance from the Pupil Personnel Office (PPO). Students may obtain a work permit from his/her employer or the receptionist in the front office at Lassiter. Any student under the age of 18 is required to complete a work permit. To request a transcript, a student or parent must come to the guidance office and fill out a "Request for Transcript" card. Once a student fills out a card, we keep it in file boxes located in the guidance reception area. Each time you request a transcript, you must fill out a card. Complete all the information on the card including the address to which you would like us to send the transcript. We cannot send a transcript without an authorized signature verifying that you have given us permission to release a copy of the student's permanent record. The first transcript is free; each additional transcript is $2.00. Give the money and the card to the receptionist. (We will provide the envelope and postage.) Once we have mailed your transcript, we will sign and date the card and keep it on file. In order for a transcript to be considered "official," it must be sent directly from the school. Seniors attending post-secondary institutions must request a final transcript be sent to the school of their choice after graduation.